Professional bowl-lift design raises bowl into mixing position. 10-speed slide control ranges from a very fast whip to a very slow stir. PowerKnead spiral dough hook replicates hand-kneading to handle 20% more dough than previous models. Durable direct drive, all-steel gear transmission delivers high-performance mixing action. Commercial-style motor protection ensures motor longevity. Elegant, Satin Pearl custom finish. 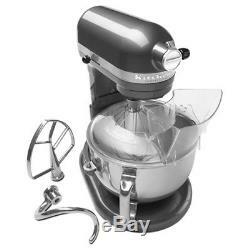 The item "KitchenAid KP26M1XPM Professional 600 Series 6-Quart Stand Mixer, Pearl Metallic" is in sale since Wednesday, November 11, 2015. This item is in the category "Home & Garden\Kitchen, Dining & Bar\Small Kitchen Appliances\Countertop Mixers". The seller is "bakedeco" and is located in Brooklyn, New York.